The Gigabyte AERO 15 seen here is your usual gaming laptop, but with a twist — a color-corrected screen. While Retina displays on Macs have become the gold standard for laptop displays, Windows machines have instead opted for absurd amounts of pixels or touchscreens — with inconsistent color reproduction and color gamut. Razer is trying to fill this gap with their Blade THX edition and Gigabyte just brought in their entry with the new AERO 15. So, are color-corrected displays a gimmick, or do they help the editors and creatives who hope their laptop screens are displaying colors accurately? Does a color-corrected display matter? 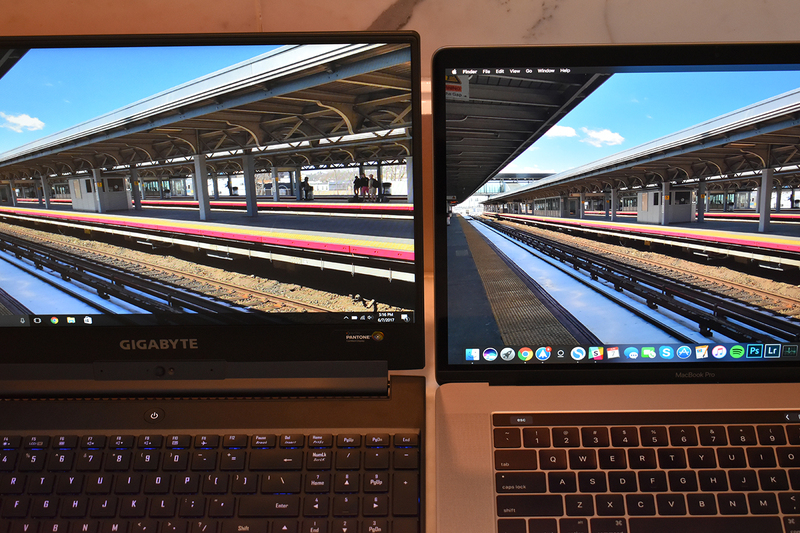 The AERO 15 doesn’t have a sub-par display, but next to a MacBook Pro it still looks pale, with a colder hue compared to the Pro’s warmer, crisper look. To the naked eye, the differences might be due to the Pro using a glossy, 15.4-inch 2880×1800 display that makes colors “pop,” while the AERO 15 is using a lower resolution 1080p, 15.6-inch matte screen. The slightly longer answer: Creatives who have been using Macs for years have benefited from a color profile and screen technology tuned to be vibrant and accurate. On the other hand, recent Windows laptops haven’t paid the same attention to detail regarding colors, instead opting for absurd amounts of pixels (like 4K displays) or touchscreens. The AERO 15 comes with a ton of pre-loaded software, much to my disappointment, but some of it is useful, like the Smart Manager app that controls most of the special functions on the AERO 15. Within the “Smart Manager,” you can select the display’s native colors, control color temperature in Kelvin or switch to the X-Rite mode. When you do, you’ll notice colors are slightly muted, with less contrast and what seems like increased clarity, sharpness and more subtle color reproduction. But remember, that’s all according to the naked eye. I asked video editors and illustrators at TechCrunch, as well as friends who have similar display color needs, about what this means to them. I’ve often been told glossy is the way to go (as well as buying a Mac), and on a personal note, I agree. However, unlike the Retina display, you’ll be able to see under sunlight. While I get Gigabyte’s approach was going for color precision and accuracy, I can’t imagine the creators who want a color-corrected display will find a 1080p HD, matte panel interesting. We live in a post-HD age, even if it just means having HD content on a higher-resolution screen. Only PC gamers really swear by this standard, but that’s changing, as well. Full HD’s prevalence in PC gaming is thanks to the middle ground between quality, aspect ratio and performance. Here, the AERO 15 scores a 60 percent Adobe RGB color gamut with 890-:1 color contrast in its default color profile. Both are decent scores, but not for an editing display, by any stretch whatsoever. However, activating the X-Rite correction closes the gap, but still leaves you with a slow 32ms response time (desktop monitors often score less than 3ms). It makes me think how much better the display would be if, by default, it were a better display to begin with. Beggars can’t be choosers, I suppose. If you weren’t even aware of the color-correction discussion, then you’d still be happy to know as a gaming machine, the AERO 15 can power anything I throw at it. A VR-ready, NVIDIA GTX 1060 graphics chip with 6GB of GDDR5 memory has the resources to run most games at high to ultra settings, at the native 1080p resolution. This includes Battlefield 1 on DirectX 12, Rainbow Six: Siege, Escape From Tarkov (which is still in alpha) and League of Legends — all of which run at an FPS upwards of 60 to 120 frames per second. So, you’re pretty safe. The rest of AERO 15’s specs are in line with current-generation laptops: an Intel Core i7-7700HQ processor, a 512GB solid state drive and 16GB of DDR4-2400MHz RAM. The keyboard, mouse, speakers, port selection and camera are all decent. Keyboard travel is smooth and mechanical and the touchpad is large and fairly smooth (not to be used for gaming). You get a healthy set of three USB 3.0 ports, Ethernet, HDMI-out, DisplayPort, audio jack, SD card slot, Kensington lock slot and a single, lonely USB-C port. Lastly, the camera is mounted at the bottom of the system, so everyone will see your nose hair — thanks Gigabyte. When driving intense VR applications, you’d often have to degrade eye candy in exchange for FPS on mobile systems; this is true here. Any serious PC gamer knows, the most bang for your buck comes from building your own desktop system. For the $1,899 price of this laptop, you could have better specs and drive all the VR apps you’d ever want, until you get VR sickness. Don’t do that last part… but it’s just a thought. Without a doubt, the AERO 15 can be a fast, slim gaming laptop with edgy materials and a 16.8 million color programmable mechanical keyboard. However, NVIDIA’s recent announcement of the Max Q design spec for its GTX 10 series chips means thinner gaming laptops will be released in just a few short months, if not weeks. You can also bet that some of them will tackle the color-correction issue. So, an evolving market puts the AERO 15 in a predicament that as a reviewer, makes it difficult to judge. The only shreds of originality here are the edgeless display and X-Rite color-correction software. At least in the case of the AERO 15’s screen, if you’re seeing orange, it’s probably true.